As traditional television viewing habits are changing, more and more people are cutting the cord when it comes to pay TV and landlines. Known as cord cutters, this new wave of entertainment hungry viewers are turning to lower cost OTT services by rigging their homes up with a viewing platform via a solid broadband connection – and this is catching on like wildfire. Not only are people cutting the cord on old and tired viewing methods, they’re also turning to new viewing mediums, with an emphasis on portability: people want to watch things, how they want, when they want and most importantly, wherever they want. The latest study from Digitalsmiths shows that around 55.1% of people now use OTT services such as Netflix and Hulu to get their entertainment fix. Some 25.8% of the surveyed viewers watch one to two hours a week of video on tablets, compared to 19.2% a year ago and 19.8% two years ago. 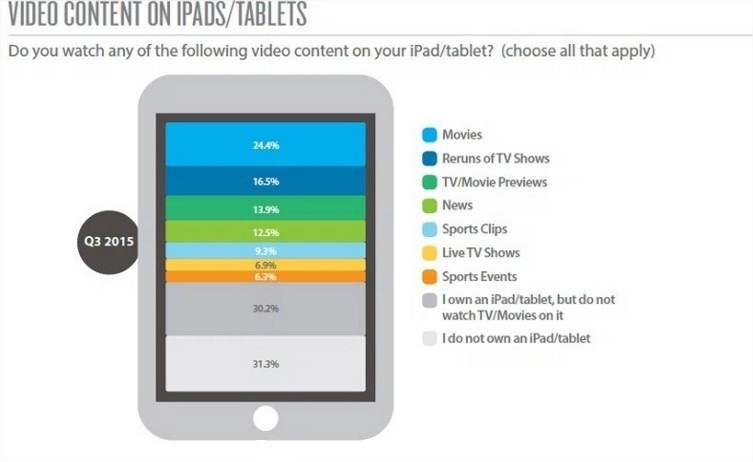 About 24.4% claimed that they watch movies on iPads or other tablets. 16.5% watch TV reruns, 13.9% watch TV or movie previews, 12.55 watch sports clips, and 9.3% watch live TV shows. In fact, according to our very own data, 40% more people are tuning into their favorite live events and shows from tablets, compared to this time last year. That’s quite an incredible increase in such a short space of time. It seems that due to the very nature of their attitudes to viewing, most cord cutters prefer tablets as these portable digital devices are not only compact and user friendly, they also offer a quality viewing platform that can be taken anywhere in the home, or in the world for that matter. All that’s required is a tablet, an app and a wireless internet connection to chow down on hours of serious entertainment. Cord cutters like to take charge of their personal entertainment and the portability that tablets provide cater to this empowered outlook on viewing. In order to adapt to this new trend of mobile viewers, OTT providers must ensure that their interface is fully optimised for smartphone and tablets; user experience and picture quality are key to loyalty and success, so ignoring these elements is almost certain to have a detrimental effect. But, not only does it pay to have a mobile interface that sings and fits beautifully onto a smaller screen, it’s also worth working with major mobile operators to ensure a smooth service without poor picture quality, sub-standard streaming speeds and video latency. In this ever changing technological world, the pace is increasing and people want access to information and entertainment instantly, so it’s not out of the question to think that almost everyone with access to a wireless internet connection will be tuning in via their mobiles and tablets within five years. These days, people don’t want to be patient, they want portability without the kinks and bugs. As a technology leader in video e-commerce, it’s our job to provide top quality mobile services; by doing this we will ensure success, loyalty and longevity well into the next decade and beyond. Multi-device support is a top priority for Cleeng and we will keep investing and improving how our publishers video is delivered on every device.